American Century Investments conducted an online survey with 1,028 adults to better understand millennials, Gen Xers and baby boomers’ investment habits and their interest in “impact investing” – that is, investing in companies, organizations and funds that have a beneficial impact on society, while also providing a financial return to investors. Over half (54%) of millennials consider an investment’s societal impact as an important factor in their decision making process – significantly more than Gen Xers and baby boomers (34% and 37%, respectively). Impact investments appeal to half (51%) of millennials, compared to two in five (37%) Gen Xers and one in three (32%) baby boomers. One in three (31%) millennials say healthcare, including disease prevention and cures, is the cause that matters most to them if they were to make an impact investment. Since 2000, nearly $1.3 billion in dividends have been distributed to the Institute. 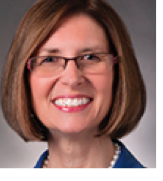 Diane Gallagher is vice president of Practice Management at American Century Investments. Diane offers insightful observations based on 20+ years of experience in the investment industry. As well as, why the firm’s ownership structure touches her personally.